FREE Download The NEW VEKA - Vertical Slider Window SystemDid you know? Originally wooden vertical sliding windows were designed to be draughty. It was a way of keeping open fires burning through airflow that was drawn up the chimney. Bahama's pressure seal technology allows you to slide the windows as before, but manage to seal from draughts despite potential friction problems during the sliding process. Discerning homeowners looking to replace wooden vertical sliding sash windows with a view to replicate the beauty and grace of the originals will be hard pressed to find a better match than The Bahama Slider. Not only do these replacement sash windows look very similar to their traditional timber predecessors, they are also significantly more energy-efficient and much simpler to maintain. These technically advanced double glazed sash windows offer heritage and technology in perfect partnership. Ideally suited to homes with a traditional look and feel, they offer the added benefits of improved heat retention and security. You no longer need to worry about problematic weights and cords or any of the drawbacks typically associated with traditional sliding sash windows such as swelling, squeaking or continual repainting. With our UPVC sash windows you can simply make the most of the effortless gliding operation and relax in the knowledge that when you choose Bahama, your peace of mind is guaranteed. Bahama sash windows mean you have a wide choice to tone in with your home. They are available in white, golden oak, rosewood or a huge selection of bespoke colours - just ask your Bahama representative for details. 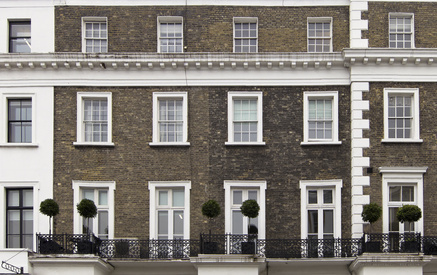 Bahama Vertical Sliding windows are the perfect replacement sash window for the heritage retrofit market. They have been carefully designed to look virtually indistinguishable from the traditional timber variants, which means they can be well suited to installation in listed buildings. The visually pleasing slimline appearance of these UPVC sash windows is supported by a truly energy efficient design. Fabricated using our VEKA fully sculptured matrix system, the window offers a slimline outer frame (136mm x 68mm) and combines good looks with maximum thermal efficiency. The window improves installation flexibility whilst retaining compatibility with all VEKA fixing brackets. Most often ordered in white,but the latest Bahama coloured foils including the new grey, plus golden oak on caramel, rosewood on dark brown or either of the woodgrains on white are readily available. Cill: The universal design of these window frames allows for either overhanging or stub cill. The rear projection results in far less complex fabrication, meaning that the construction is simpler and less likely to create the opportunity for operator error. Bahama vertical sliding sash windows have the option of decorative display horns that hang below the slider: horns which are separately attached, horns machined into the upper jambs or no horns at all - the choice is entirely yours. This sash window has been designed with bespoke gearing to accept various components from any of the major suppliers. The window will also accept heavy duty spring balances and trickle vents within the head of the frame. Bahama use top quality spring balances. Its complicated. The windows have to be made, weight assessed, and then have a specialist spring balance mechanic fine tune the mechanism, somewhat like a piano tuner, before Bahama introduces the well balanced finished product to your home. You can then slide the windows up or down problem free and they will automatically stop along the travel automatically at any point you wish without inconveniently dropping down. 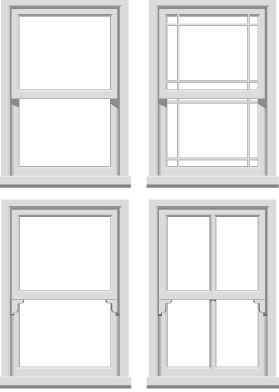 The Vertical sliding replacement sash window was designed to accommodate a Glazing thickness of 28mm, but when it is used with the 58mm bead range, it will accept glazing of up to 44mm for triple glazed, making it a superb heritage sash window with advanced 21st century energy-efficiency. Double glazing not only helps to minimise heat lost through UPVC sash windows but also helps cut down unwelcome outdoor noise resulting from passing traffic and noisy neighbours. The system offers two bottom sash options: four sided fully welded and three sided welded with mechanically coupled wide bottom rail. Energy efficient replacement sash windows from Network VEKA will help minimise heat loss, saving costs on your heating bills and helping save the planet!